In retrospect on the Bamboo Design Workshop coordinated with Paraa. A city with a rapidly growing economy and an equally booming urban development sector, Dhaka, as we all know, faces a harsh deficit in urban spaces for recreation, rest and realization. It is a city undergoing spontaneous growth in order to meet the high demand for housing, leaving no space for a pause. One of the primary reasons behind this escalating need is an extravagant number of 600,000 climate change and economic imbalance induced migrants (UNDP report from 2009) entering Dhaka annually. Dhaka, in its race to serve this increasing population density, is not only failing drastically but resulting evidently in overpriced land, informal hovels, underprivileged floating communities, and a building sector with little consideration to the environmental and social ethics. Limited amount of land area and exorbitant prices have not only lead to the encroachment of this city’s water bodies and agricultural lands by builders, but also caused the peri – urban areas, previously agricultural fields, to undergo land filling so that they may be developed into areas for ‘new housing.’ The case of a recently developing land area, Washpur Garden City in Bosila, within Keraniganj Upazilla is no different. Land are here has also been divided up into 3 – 5 katha plot sizes and sold off effortlessly under the name of ‘green housing and high livability standards.’ However among the many insufficiencies, an alarming one, revealed through conversation with a present landowner, is that only 5 katha of land area has been allocated for community play by the housing authorities. Buyers and builders have little to complain nevertheless, not realizing what is at a loss here. Out of the many plots within this housing, one is owned by LEEDO – a local charity that works to support a number of underprivileged floating children through education, health and their basic needs. Paraa – a multidisciplinary design and architectural studio focusing on enhancing spaces with the communities, has been working with LEEDO since 2013. 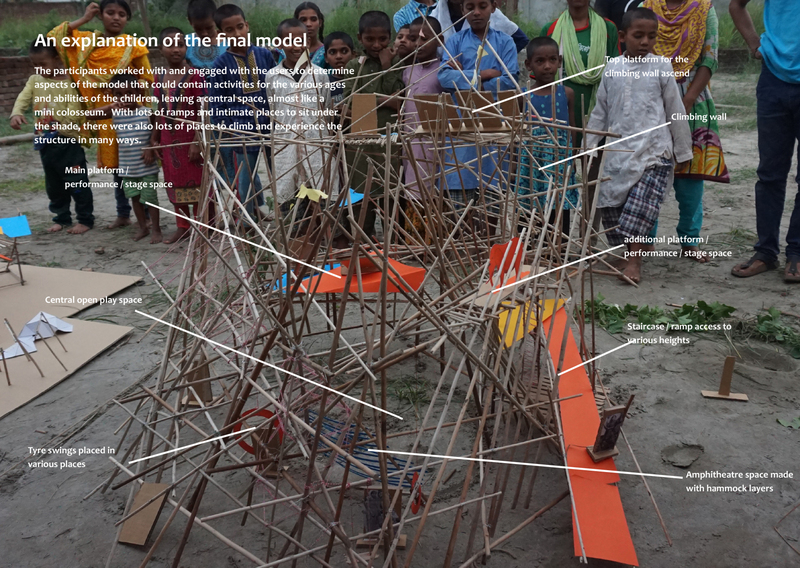 It seeks to understand the role of designers in projects that work with and for the vulnerable urban children of Dhaka. Through previous collaborations, indebt study of the children’s lifestyle and the direction of Washpur Garden City’s upcoming development, we at Paraa recognized this neighborhood’s crucial need for a space of reflection, for children’s play and one which allows a scope for investigation on models of urban landscape. 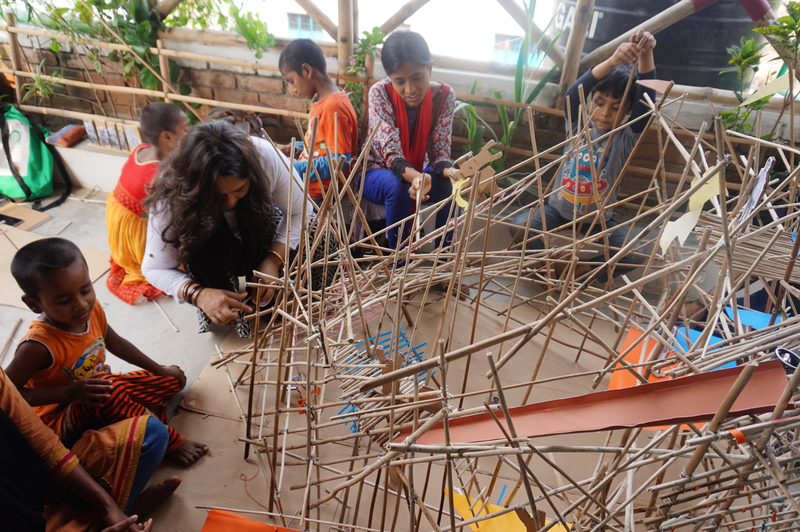 Grounded on these thoughts the ‘Bamboo Design Build Workshop’ was launched on April 2017 with support from Ghorami.Jon, HBRI Bangladesh and others. This workshop was launched after the particular success of a previous attempt by Paraa, where the design of a ‘Play Garden’ for the underprivileged urban children of the LEEDO Peace Home was worked on with the focus to generate awareness on models of urban agriculture and the importance of play for growing children. 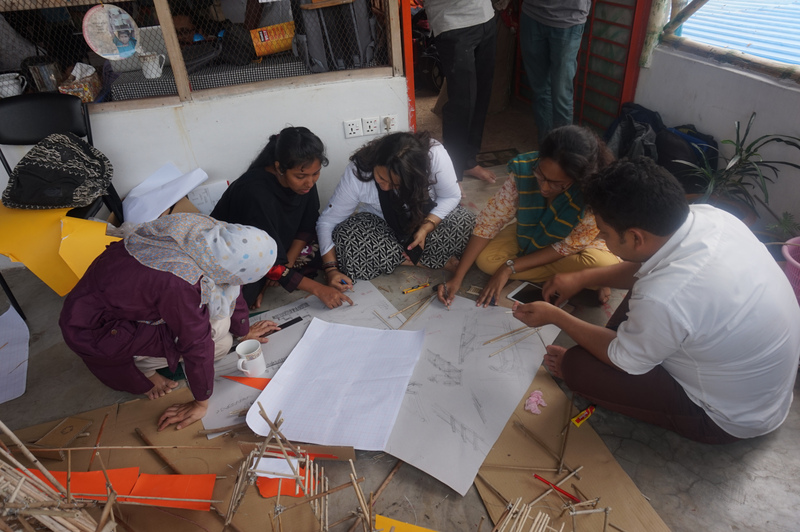 This workshop comprehended on the previous understandings, and sought to explore ways to meet the UN Sustainability goals, methods of participatory design – its importance and impact and methods of rethinking institutionalized design processes. The bamboo workshop was designed to generate awareness on livability standards within the community and on the use of sustainable resources. It also worked on explaining to the young architects the role of a user in designing their own spaces. We planned the 12 day design build workshop to guide the participants into unlearning the conventional models of design, where design is usually preconceived, made mostly through computer generated modeling or through the top down design method. We guided participants to learn design through participation and building through apprenticeship. 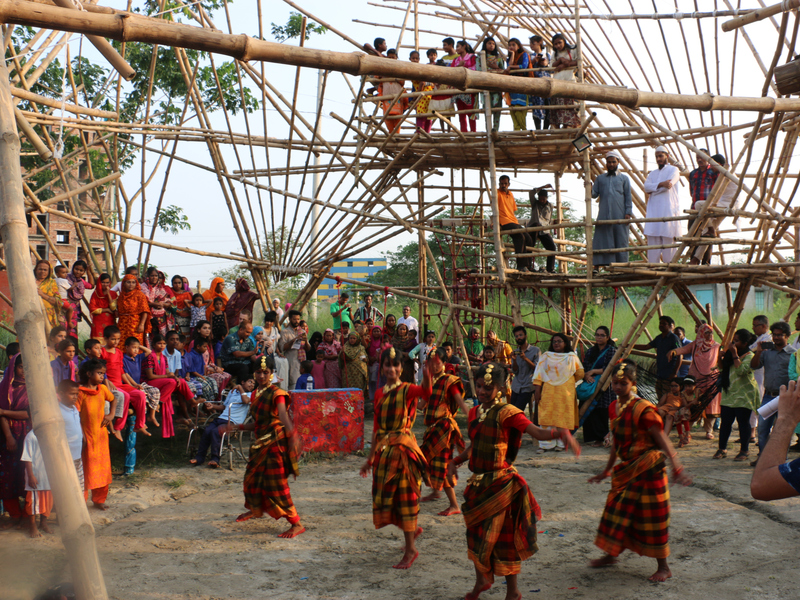 Sessions were designed to help learn how to work with the people – the bamboo construction facilitators, the children’s community, the craftsmen and the artists. The design conditions of the workshop were set to bring out a proposal that had the qualities of an ‘experiential urban platform of learning and sharing for all children.’ This was because we intended to remove the identity crisis that the children of the Peace Home currently face and also create an opportunity for them to feel belonged. The children coming from an unconventional background are not widely accepted as we all know, and thus the intention to create a space owned by them by for the community and neighborhood. It was also set to create a scope of revenue generation for LEEDO, possibly through collaborations with other schools by hosting book fairs, crafts workshops, children’s fairs and so on. The built outcome of this workshop may lack ‘architectural grammar and aesthetic’ as observed by some. 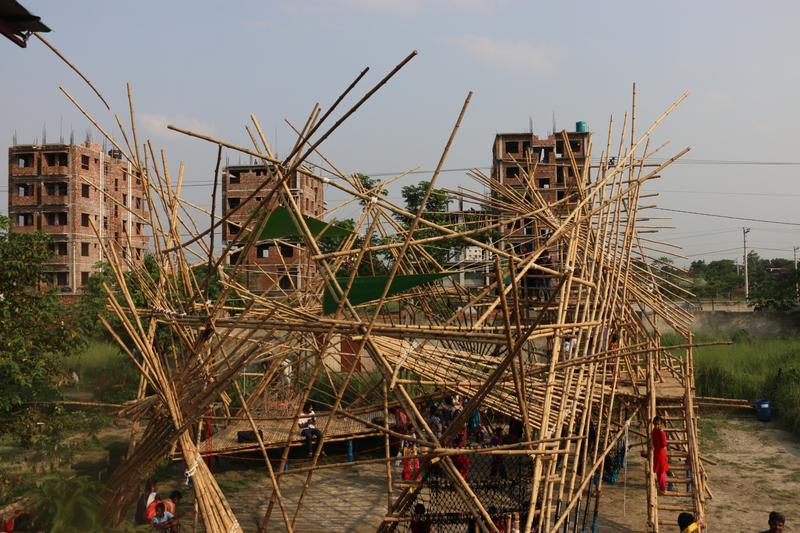 Architectural critics may comment that the space could have been built through modulation, exploring architectonics, innovative bamboo construction technology and geometry, and it must have been at the least treated the bamboo pieces through chemical injection. However, what needs to be understood here, is that the built space is an outcome of a process led design method and not one that focused on the innovative methods of constructing with bamboo that we typically find online. It was focused to promote the local bamboo construction methods thus appointing Badshah Bhai – a local bamboo construction facilitator, as the lead coordinator of the built sessions. The designed structure follows spontaneity but does have a hidden grammar. Elements have been placed to intentionally defy geometry to allow easy maintenance – replacement of any element without hampering spatial quality, and to defy the stagnant form which built forms usually take up. Built from a pentagonal base for stability, the geometry was later broken deliberately to prevent the idea that an architect has the sole quality of designing spaces from flourishing. It has been left ‘unfinished’ to allow the users of the space to personalize as necessary without any institutionalized guidance. On the note of durability, chemical treatment was avoided as we believe this process hampers the inherent characteristics of bamboo and contradicts with the idea of environment friendly and sustainable architecture. 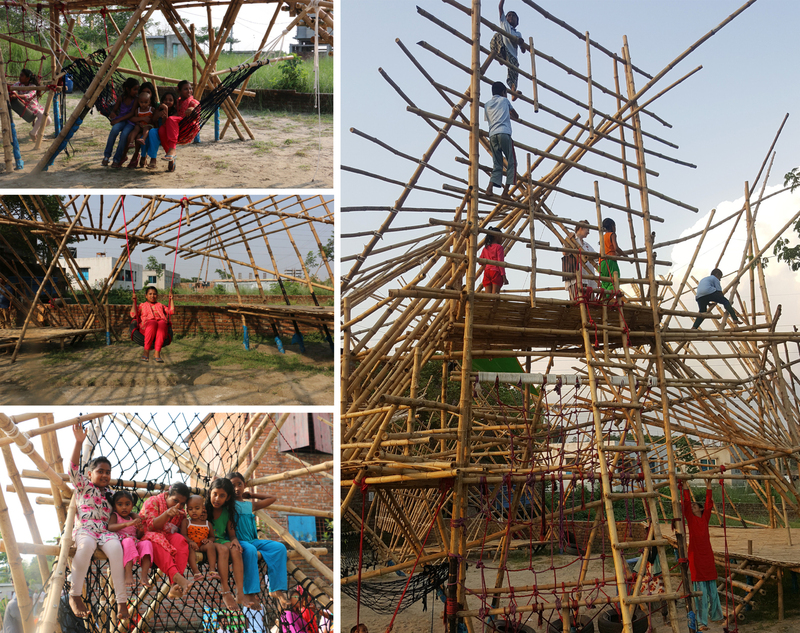 The Play Space intended for use by the children of the LEEDO Peace Home, along with the people of the local neighborhood and of Dhaka, provides a precedent for understanding the role of architects in civic or public space creation, and especially, working with a user group to design the place in a participatory manner. Although this project is temporary ( up to 2 years) it is intended to provide a much needed amenity – a space to play, to relax, to sit, to enjoy performances and beyond. At the scale the project has been delivered, it is intended to inspire young architects intending to push forward some of the boundaries of what is possible. At the same time, this space now open to public, is simply a new play space for the many vulnerable children of LEEDO Peace Home. Regarding the involvement of the children in feedback and also the design development processes: This is always going to be the most difficult design challenge, and perhaps, not enough was done. So, although there was plenty of engaged workshops and friendships developed, there could have been better workshop designs. A key note here and the importance for Paraa in this process was to show that it is not so easy to quickly get the information (the user is not just a data source) but to develop meaningful interactions and participation if possible. Regarding the wider engagement with the local community: Although we intended to engage with the local public, the time and resources did not allow for such an activity. However, on the opening day, the public came, enjoyed the space immensely and gave us positive feedback throughout the construction phase. They were intrigued, and we imagine, will make full use of the space too. There are three Germans in our office!